In the Himalayas, a young monk, about to be crowned the Rinpoche of the monastery, is kidnapped by a gang of black magicians who wish to make a human sacrifice of the Rinpoche to attain invincibility. The young Rinpoche manages to escape from the clutches of the magicians and runs away to Kathmandu. At the other end of the subcontinent, in a small village in Kerala, Ashokan (Mohanlal) is an unemployed youth of no great virtues ends up guarding ….. that was ‘Yodha’ – Malayalam movie of 1992 scripted by Sasidharan Arattuvazhi and directed by Sangeeth Sivan, starring Mohanlal in the lead. Stefani Joanne Angelina Germanotta [famously Lady Gaga] is an American singer, songwriter, and actress. Her debut album The Fame (2008) was a critical and commercial success that produced global chart-topping singles such as "Just Dance" and "Poker Face". With global album and single sales of 27 million and 146 million respectively, as of January 2016, she is one of the best-selling musicians of all time. Her achievements include twelve Guinness World Records, three Brit Awards, and six Grammy Awards. She is also the first artist to win the Songwriters Hall of Fame's Contemporary Icon Award. She is in news because of her meeting ! – news reports suggest that Communist party’s propaganda department reportedly has issued ‘important instruction’ blocking singer’s entire repertoire from mainland. 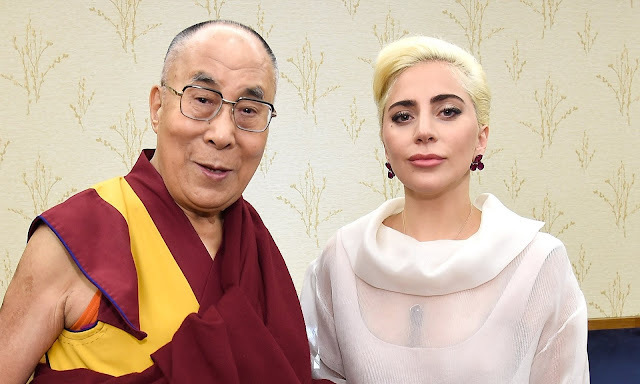 Lady Gaga has reportedly been added to a list of hostile foreign forces banned by China’s Communist party after she met with the Dalai Lama to discuss yoga. The American pop singer, who has sold more than 27m albums, met the exiled Tibetan spiritual leader on Sunday before a conference in Indianapolis. A video of the 19-minute encounter – in which the pair pondered issues such as meditation, mental health and how to detoxify humanity – was posted on the singer’s Facebook account. The meeting sparked an angry reaction from Beijing, which has attacked the spiritual leader as a “wolf in monk’s robes”. The Dalai Lama, who fled into exile in March 1959, insists he is merely seeking greater autonomy from Chinese rule for Tibetans. But China’s rulers consider him a separatist who they claim is conspiring to split the Himalayan region from China in order to establish theocratic rule there. Following Lady Gaga’s meeting, the Communist party’s mysterious propaganda department issued “an important instruction” banning her entire repertoire from mainland China, Hong Kong’s pro-democracy newspaper Apple Daily reported on Monday. Chinese websites and media organisations were ordered to stop uploading or distributing her songs in a sign of Beijing’s irritation, the newspaper said. The propaganda department also issued orders for party-controlled news outlets such as state broadcaster CCTV and newspapers the People’s Daily and the Global Times to condemn the meeting. Asked by a foreign reporter whether the tête-à-tête would create a “bad romance” between Beijing and Lady Gaga, a spokesperson for China’s foreign ministry initially hinted that he was not familiar with the pop star’s Grammy-winning back catalogue. “Who?” Hong Lei said when asked for Beijing’s view on the singer’s meeting. China has previously banned artists and groups such as Maroon 5, Bjork and Oasis from performing in the country after they met with the Dalai Lama or spoke out in favour of him or Tibetan independence. China’s media regulators often issue similar directives when sensitive issues surface, telling news outlets to stop covering stories, use only official reports, and sometimes remove articles from their websites. So in China, she may not be on web ! – back in Feb 2014, US President Barack Obama met the Dalai Lama at the White House despite objections from China, which warned that the meeting would inflict grave damage on Sino-American relations. The two Nobel laureates spent an hour in the White House's Map Room, a step down in prestige from the Oval Office, where the president traditionally meets foreign heads of state. The meeting was closed to reporters. China responded with equal vitriol to Obama's meetings with him, in 2010 and 2011, though it did not follow up with concrete measures that would damage ties. In contrast, Beijing cut off high-level diplomatic ties with the UK for about a year after David Cameron met the Dalai Lama in 2012. "We can only push the west to change its way of thinking if we let them understand that China's power cannot be avoided … and that the west's interests lie in development and maintaining ties with China, not the opposite," a media person in China wrote. Anyway, such actions will not ignite debates of intolerance ! !